This is not strictly accurate, in fact women, do seem to have been able to hold priestly offices, from the Old Kingdom onwards. While it was not common for women to hold high ranking religious offices, it did occur frequently during various periods in Egyptian history. During the Old Kingdom a large number of high-class women were priestesses of Hathor, with the priestly rank of hemet netjer. Hemet netjer was the feminine form of a common male priest title called hem netjer, which donated a type of priest within the temple hierarchy. This title seems to be in use until the Middle Kingdom. There were also women who ‘performed wab service for Hathor’ during the Olding Kingdom and received the same payment as male wab priests. The title used was wabet, which is from wab meaning ‘to be pure’; and there are a few cases of wabet priestesses known from the Middle Kingdom. There is evidence for women who were priestesses of the Goddesses and even gods. Ladies from high society, or simply priests daughters, who inherited their fathers offices, these women seem to have been able to perform the rituals as well as men. During the Old Kingdom, for example, many women from the leading families participated in Divine Cults, particularly Neith and Hathor, though it appears that they could not serve male gods. 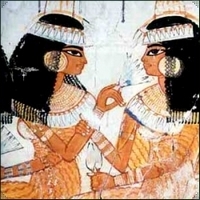 Women also made appearances on certain well-defined occasions; for example when the mysteries were enacted, two women played the role of the goddesses Isis and Nephthys. Such occasions have been found depicted in wall relief’s, in a scene in front of the entrance to the propylaeum of the Temple of Abydos. Whether the young women called upon to perform this function were members of the permanent personnel of the temple or they had been invited to play those roles on an occasional basis is uncertain; but is seems likely that they were they former. The weaving and presentation of cloth was part of the ritual in the cults of the goddess Hathor. An inscription at the temple of Dendera refers to women of priestly rank translated as ‘She who unites with the Red Cloth’. There are several references to a college of Theban temple women; a daughter of the Chief of the Libu tribe, Nebimuemhat, belonged to this priestly college. Other inscriptions mention a priestly position of the ’nurses of Khonsu the Child’, and it seems likely that these nurses were ladies of his hener. Osorkon III (779-749BC) established his daughter, Shepenwepet I, as a celibate God’s Wife who would live in Thebes and give all her attention to the Karnak temples and cults. She received all the estates and property formally possessed by the High Priest and in religious matters was very like a female Pope, ruling by the Word of Atum. A further text concerns two girls, Thaues and Taous, whom the Greek text calls the ‘Serapeum Twins’ . From a Greek Papyrus, 163-162BC, discovered at Memphis and now in the British Museum in London (P.Lond. 26). Since the twins writing this petition, were preceded in their positions by twins, this was probably a traditional appointment. "To King Ptolemy and Queen Cleopatra the sister, gods Philometores, greeting. Thaues and Taous, twins, perform rites in the great Sarapion  at Memphis. " New Kingdom temple scenes depict a class of male and female temple personnel called henuty for men and henutet for women. This word is often translated as meaning ‘servant’. They are depicted in the scene together with male priests and the God’s Wife in rituals. The title does not seem to appear among the elite class of the population and the function of these temple personnel is unknown. During the Ptolemaic Period, the High Priest of Memphis, who performed the coronation ceremony, held the most important position in the religious hierarchy. His wife also played a prominent part in her role as priestess; she formed part of the body of women whose most senior members acted as the Gods consorts, protectresses and mothers. The Role of God’s Wife of Amun was one of the exceptions where women occupied a priestly role of high office and was to become very important during later Pharonic Periods. In the Old Kingdom, women were often priestesses of Hathor and were significant as the feminine aspect of the creator. The chief Queen represented the main God’s consort when she accompanied the king in various rituals and temple ceremonies. The prominence and importance of the role of the God’s Wife changes from dynasty to dynasty; during the times when Amun was pre-eminent, the Queen would have enacted the role of his wife, the Goddess Mut. During the 21st Dynasty, the title acquired a different use, and was transferred to the king’s daughter who now became the wife of the chief state god, Amun-Re of Thebes. In the 25th Dynasty, a further political dimension was added to the role, whereby the royal daughter and God’s Wife of Amun adopted, as her successor, the daughter of the next king. In 1904ACE, at Karnak, a statue of Ankhnesneferibe, daughter of Psammetichus II was discovered, together with a stela, which recorded her adoption as ‘heiress’ by Nictocris, daughter of Psammetichus II; it also describes her enthronement as God’s Wife of Amun. The position of God’s Wife had extensive power, wealth and status attached to it; she also enacted functions which had previously be performed by the male ‘First Prophet’ of Amun. Ankhnesneferibe was the first woman known to have held the title of ‘First Prophet’, indicating that there was a significant transfer of powers to the God’s Wife and her retinue. This redefined role was to continue for many years; yet this Theban institution of an earthly wife of the God, the Divine Adoratrice, seems to be an isolated case with no parallels in other clergies. 2. The Sarapion was a temple to the god Sarapis. The worship of Sarapis was introduced in the hellenistic era, but its origins are disputed in ancient sources and by modern scholars. Sarapis was associated with healing, "miracles," and the Underworld. The was the name given to the crown prince at birth. The name is usually proceeded by the title 'Son of Ra'. It is used to emphasise the king's role as a representative of the solar God Ra.